Marie-Louise Rossi, who died on Sunday night (26 October) at the age of 58, left a huge legacy for the London insurance market for which she acted as a powerful, persuasive advocate for over a decade while at the helm of the International Underwriting Association (IUA). 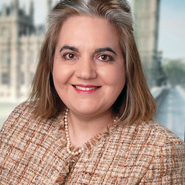 She combined her 30 year career in the insurance industry with a strong interest in politics which saw her serve as a councillor in Westminster and also fight the Parliamentary seat of the Cities of London and Westminster, albeit for different parties. The interest politics came from her father, Sir Hugh Rossi who was an Conservative MP 26 years and served as a junior minister under both Edward Heath and Margaret Thatcher. At Oxford, where she studied Literae Humaniores (Philosophy and Ancient History) at St Anne’s College, she was treasurer and secretary of the famous debating society at the Oxford Union. She also became involved in the Bow Group – a pro-Europe Conservative organisation drawing on the One Nation tradition – and later served as its chairman. Her insurance career began when she graduated in 1979 and became a credit and political risks broker, first with Hogg Robinson and later with the Sedgwick Group. After a short period as a consultant she was appointed chief executive of the London International and Reinsurance Market Association (LIRMA) in November 1993. Five years later LIRMA merged with the Institute of London Underwriters to create a single, unified voice for the London company market and Rossi was appointed as it first chief executive. Her impact on the market in this role was enormous. It was during the early part of the current century that the negotiations in Europe over the single market in reinsurance and with the United States over access to the US were at their most intense and sensitive. She was in her element. An intensely intelligent woman, which sometimes made her seem a little distanced from mere social chit-chat, she demonstrated perfect mastery of every brief. Occasionally frustrated but never outwardly angry she knew how to play the long game that is essential for success when negotiating in international forums. The success of the Reinsurance Directive which opened up European markets in 2005 was due in no small part to her persistence and ability to build alliances with key interest groups in the political labyrinth that is the European Union. With the passing of the directive she felt her work at the IUA was done and left in 2005 to pursue her political career, leaving a confident, well organised and extremely effective trade body as her lasting legacy. After serving as a Conservative councillor in the late 80s and early 90s, she found she was out of step with increasingly strident anti-European tone of the party and after a spell chairing the all party European Movement, decided to join the Liberal Democrats and it was under this new political banner that she fought the 2005 General Election, failing to make much impression on the strong Conservative majority in the Cities of London and Westminster. Recent years saw her involved in high level lobbying for the industry on wide variety of topics including environmental liability, political and terrorism risks and piracy as well as branching out into setting up and advising new businesses. She battled with cancer for several years but rarely let it stop her pursuing her twin political and industry careers, although these became increasingly fragmented as a result of the illness. She died peacefully with her elderly parents Sir Hugh and Lady Rossi at her bedside. She leaves a brother and two sisters but never married.